Voters in Liberia, Africa's oldest state, are going to the polls on 8 November to vote in the second round of the country's first presidential elections since the end of the 14-year civil war. Following the first round last month, the two candidates competing for the vote are former international footballer George Weah and Ellen Johnson-Sirleaf, a former finance minister who has worked for the World Bank. If she wins, Mrs Johnson-Sirleaf would become Africa's first elected female president. Q: How does Liberia's political system work? The president exercises executive power and is elected for a six-year term, for a maximum of two terms. The new government will replace an interim government, led by local businessman Charles Gyude Bryant, that has run the country since former President Charles Taylor was forced to step down and leave the country two years ago. Q: What will happen on election day? Around 1.3 million Liberians are registered to vote, with polling booths scheduled to remain open between 0800 and 1800 GMT. Q: Is a large turnout expected? In the first round on 11 October turnout was high, at around 74 percent of the registered voters. But there are reports that the voters' enthusiasm may have waned going into the run-off, prompting fears of a lower turnout. Q: Can Liberians living abroad participate? Liberians living abroad are not allowed to vote. Also barred are members of the influential Lebanese community. Many of them were born in Liberia but are not allowed to hold Liberian citizenship. Correspondents say whoever wins will have the enormous task of rebuilding a country shattered by the long civil war. 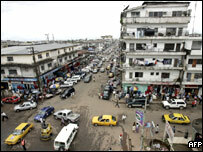 Many buildings in the capital Monrovia were destroyed and there is no mains electricity supply or running water. Education is also a key issue, as only 20% of the population can read and write. On the evidence of the first round of voting George Weah is the favourite to win. Mrs Johnson-Sirleaf finished second in the first round with 20% against Mr Weah's 28%. But, according to the BBC's Mark Doyle in Liberia, the big unknown is how the supporters of the 20 candidates knocked out in the first round of voting will now cast their ballots. Q: How soon will the results be known? It is unclear when the results will be known, but an official working for the UN Mission in Liberia told the BBC Website that the final results must be announced by 23 November at the latest. The swearing-in of the new government is expected in January 2006. Q: Are there any international observers? The UN, the EU, and other foreign and regional organisations will monitor the polls. A 15,000-member UN peacekeeping force that is already in Liberia will oversee election security. They are being supported by some 3,000 newly trained Liberian police who were deployed last week.